Last year, I signed up to craft a Softie for Mirabel and cut things so fine on the deadline front, that I arrived at the post office half a minute before closing time, which required a nauseating grovel to the Rude and Obnoxious Newsagent/Post Office Man* for an express post envelope. This year, I have not signed up to Softies for Mirabel. This is because I have developed a theory that my To Do list has become an exercise in reverse psychology. Consequently, some of last weekend was spent coming over all footloose and fancy free starting yet another project not on the To Do list. 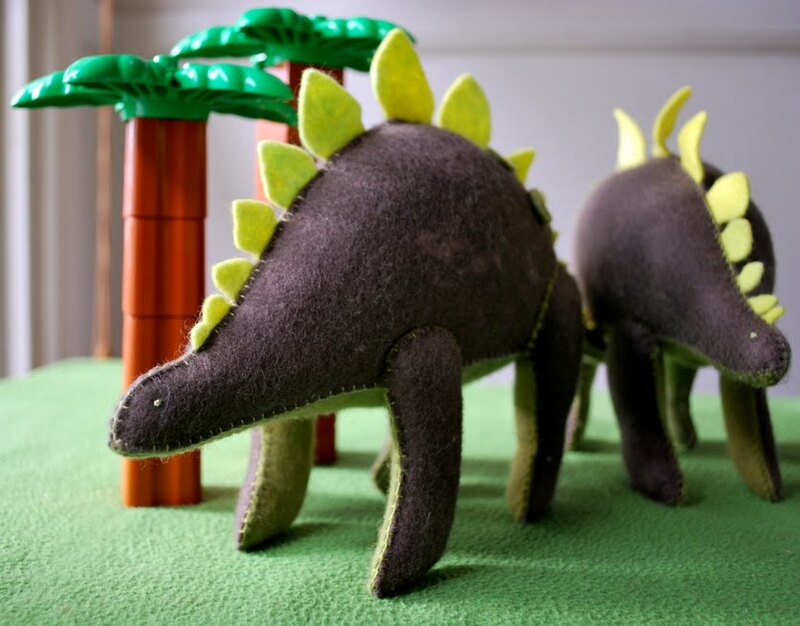 As the lucky duck winner of Clare’s Toys to Sew book giveaway, (thanks so much, excellent Clare), I was prompted to craft a stegosaurus – only with an extra, accidental, not-on-the-pattern, left leg. Not wanting to waste said leg, I produced the co-ordinating remainder of a second stegosaurus. This all means, that in a series of clever and elegant manoueuvres, I have outwitted myself with reverse-reverse psychology. A Softie for Mirabel, sans speedy postal requirements (signing up any tick of the clock now) AND a kid birthday present crossed off that To Do List. 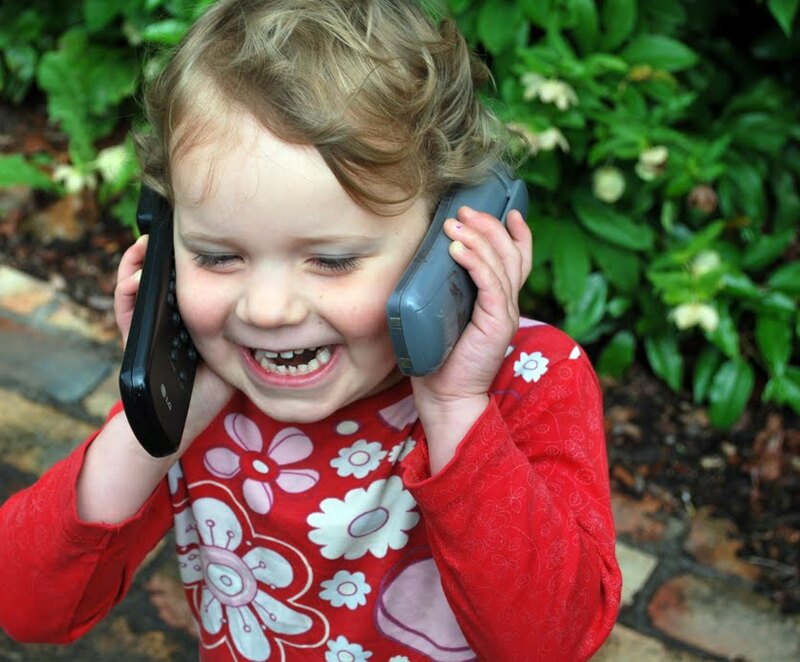 This is the smallest, having a wild time chatting to her two imaginary friends, Neenie and Sophie. On this occasion the kid is using a well and truly defunct home phone and a TV remote that somebody donated for the chatting-to-imaginary-friend cause. With a little creativity, who needs a mobile phone? Certainly, who needs an old, non-functioning, communing-with-dust-bunnies mobile phone? The recycling of mobile phones can make a big difference for young Australians suffering from cancer. Basically you’re turning trash into funding which goes toward the building of specialised youth cancer treatment centres. All you need do is pop over to www.youcan.org.au to request a Reply Paid mobile phone recycling envelope (and for loads more info). Redundant mobile phones can also be dropped into You Can bins located in a range of retailers Australia-wide: Sony Centre, Best & Less, Harvey Norman and Leading Edge Computers. Oh and you can sign up to Softies for Mirabel right here, over at Pip’s. This act-getting-together thing feels pretty good. oh well done you. I just finished being completely shallow and came here - you just about ruined my day you amazing woman. Nah, not really - fabulous 'saurus - can't show W or he will expect similar kinds of fabulousness from me. Actually, maybe a good christmas present - where did you get the pattern? Now look what you have done! You have gone and reversed my own reversal, which to be honest wasn't working one little bit. Now I'm thinking dinosaur instead of Goldilocks. Because if I made Goldi, there are 3 bears that need to go along with and possibly porridge and chairs and beds... of which, at least one needs to be 'just right'. So 2 dinos are suddenly seeming doable. I may have just talked myself into it. They are very fine looking dinos, well done. What cute steggies they are. Your post reminded me that I must post off my softie tomorrow so it makes it im time to be given out. I think the reverse reverse psychology works for you! How cute using a tv remote, maybe it gets better reception than the mobile phone, lol! ...so you decided against the Jake-the-Pegasaurus then? BOOM BOOM! Love love love your dinosaurs , so cute ! I bought a new phone not that long ago and in the box was the recycling bag for the old one , I was impressed ! Awesome dino!I can imagine the eye sparkle they will create! Thanks for the link...I am a bit behind when it comes to mobile phone but did not know about it. Your daughter's name isn't Lally is it? If it is, I think my Sophie may have been returning her calls. Diggin the reverse psychology big stylee. Your work is , as always, superb. That's cool. We all seem to know how effective reverse psychology is, but it still amazes us when it works! LOVE your dino!! Loving your girls multi tasking too. Great dinos. Oh the joys of out-witting yourself! Well, you did a lovely job of fooling yourself. Just don't reverse reverse reverse, or you'll have trouble! Dead impressed with the stegosaurs! Discovered your blog today, its great. These Dinos are amazing and in particular the toilet sign you've made - I love it. Yes, but does reverse psychology work if you do it to yourself, On Purpose? MegaStega achievements - go you! great idea! except i already signed up for softies for mirabel and also still haven't done my softie. sigh. You are putting the rest of us to shame lady! Love the Steggies. The shoe phone (think Maxwell Smart) gets a good work out here, often both shoes at the same time. Thank you - you are AWESOME! 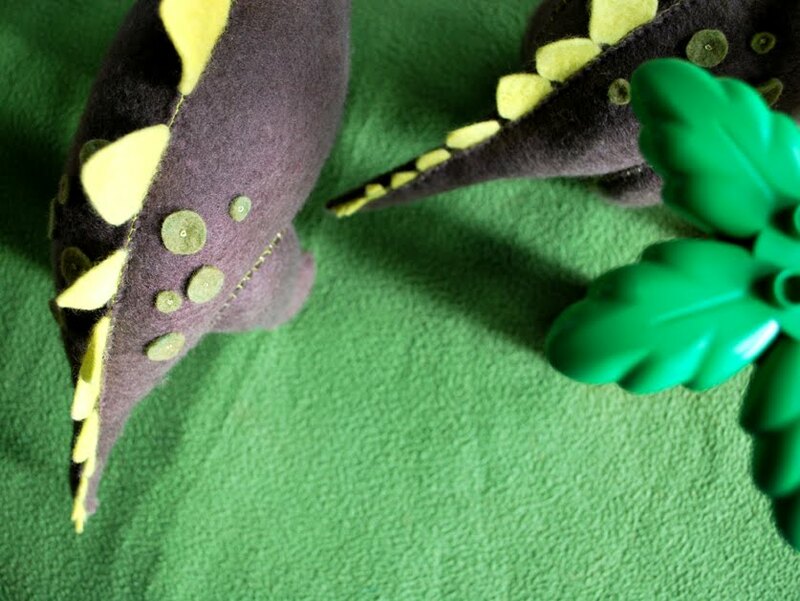 Amazing softies - loving the dino love. Reverse reverse psychology? Is that like a Jedi mind trick? Where did you buy your actual trees from the Cambrian era? The stegs are right at home. Very clever use of the extra leg. I am very pleased to say that when I purchased a new phone on the weekend there was a postage paid bag inside that allowed my to donate my old phone with any effort at all. Smart thinking there on someone's behalf. I thought I was beyond dinosaurs. Apparently I am not! Those are amazing and thank goodness for that extra leg bit ;) And good call on the cell phones. We collect them around here for the women and children shelters so they have emergency phones. Love your stegasaurus-s. Stegasaurusi? Anyway, love them. SOOO cute. Good on you, for getting your act together so impressively. Now for the Christmas shopping, eh? Or have you done that too?